The complete secret diary of a WW2 prisoner of the Japanese. 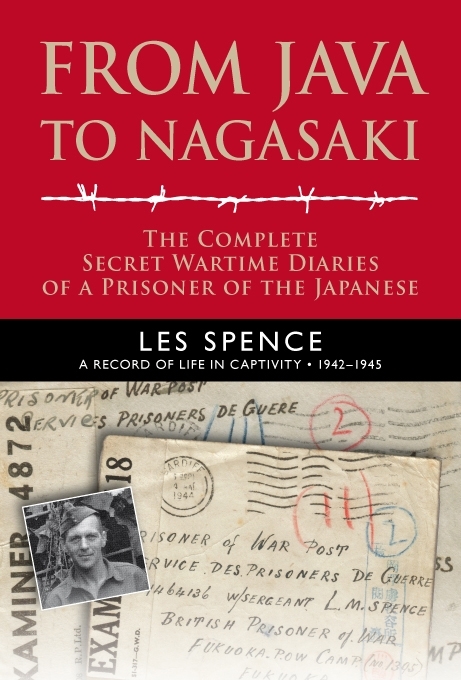 Les Spence, of the 77th HAA Regiment, risked his life to keep a remarkable diary in Tandjong Priok, Bicycle Camp, aboard the ‘Ussuri Maru’ and in the coal-mining Camp 8, Inatsukimachi, Japan. When he died in 1989 – after a sporting and administrative career which saw him become president of the Welsh Rugby Union – he left wishes for the diaries to be published. But they were lost and believed destroyed. Then, a few years ago, they were found in a cupboard in a newspaper office. Finally, Les’ wish can be kept. The 68,000-word diaries cover the period from January 1942 to November 1945. They start on board convoy and end aboard the Queen Mary. And as number 2 in one of the camps nearestNagasaki, Les was able to record the dropping of the plutonium bomb. Les records the experiences and deaths of many of his comrades. He vividly describes the conditions and life in the camps and the growing death toll. The book is illustrated and includes 20 pages of reference notes. The book is priced £16.99 and is published by Magic Rat Books (www.magicrat.co.uk). The ISBN number is 978-0-9562722-2-5. A donation will be paid to Java Club from each book sold. My grandfather was in the same regiment as Les Spence and we think that maybe it is him in the picture of them on Christmas day, although sadly looking very ill….. There are a few photos in that Christmas Day series. They were taken by a Japanese newspaper for propaganda purposes. What was your grandfather’s name? Hi greg I live in Tasmania Australia and have been researching my uncle for the last two years who was in the 77 haa regiment. My uncle was in the 240 battery do you think there would be any information about him in your book? His name was Thomas Henry Bartlett. Hi Pam, I can check for you. There is obviously a huge amount of information about 240 – its movements, conditions etc. As it was all written at the time and in detail, it’s a pretty amazing document for historians of the 77th. Many prisoners are mentioned by name, although these are mainly ones who Les chatted to or was friends with, or those he recorded as they went through illness etc or died. Hi Kayleigh, which is your grandfather. Is he in a photo in the book? Thanks greg that would be great. I have spent an enormous amount of time over the last couple of years researching my uncle. I have never managed to find out any information after he was captured (8/3/42) until he died on the Tamahoko Maru (24/6/44) He also had a brother William Arthur Bartlett (called Roly) who was in the 239 battery 77 HAA. captured same time. He survived as a pow but passed away in the 90’s and never saw Tom again after capture. All we knew was that Tom died at sea. I do have a photo of Tom. Hi Greg I have a photo of Tom (240 battery 77 haa) with five members of his regiment not sure where it is taken and a photo of Roly (239 battery 77 haa)at TanjonPriok pow camp Java 1942 with nine other prisoners taken by Frank Jett(think thats the surname)another prisoner. Also an invitation for Roly dated 2/9/42 by the japanese camp I suppose for a rugby football match between Wales v the rest (scotland ireland colonies etc).Maybe there is something in the book about this. One of Les’ close friends died on the Tamahoko Maru. Les and your uncle must have been in the same camps together until Singapore then. I can’t see a specific reference to your uncle but the first half of the diary is about life in Tandjong Priok. Les records the games of football (soccer) and rugby that they played. The game recorded on 2.9.42 was a “league final” which ended in a draw! Tandjong Priok photos sound absolutely fascinating. Thanks very much for checking Greg, it’s interesting that the rugby/football match is mentioned. Our family have purchased the book online today. I am looking forward to reading it. The Tandjong Priok photo is Roly with another nine prisoners, not much to see in the background. I can email you a copy if you would like one. Thanks again for your help. The 24th June is the 68th anniversary of the sinking of the Tamahoko Maru. I found an Australian survivor from this ship and I spoke to him on the phone last week. That was interesting to think he was on the same ship as Tom sixty eight years ago. Wow, Pam. You found someone on the ship. You should try to record an interview with him. Be worth keeping for yourself. I’ll try to mark the 68th anniversary – thanks for the reminder. Order received. Will get the book in the post later today. Thanks for getting the book off so quick, you might have noticed it was purchased by Tom Bartlett (my brother) the same name as my uncle that I am researching. The survivor I spoke to was only 86, he told me he was only 15 when he joined up by putting his age up. He said after being a prisoner of war and surviving the sinking of the Tamahoko Maru he was only 19 when the war finished. Difficult to imagine a 19 year old today having been through all that. He obviously didn’t know my uncle but knew there were many british prisoners on the ship.Will email the photos soon. An amazing book, a remarkable account of the terrible conditions and suffering the prisoners endured during their captivity, the awful transfers on the hellships and the cruel slave labour camps. A must read. I have just visited the Yokohama war cemetery and found William Charles Judd’s gunner 21st A.A. Regt, grave he was my husbands Father, he died 11th March 1944. He was captured in 1942 was in Batavia, Tjilajap & Suerbaja he ended up in Osaka 14b. All those young men that suffered so much may peace prevail. Thanks for the comment, Roberta. Some of the 21st LAA were listed in Les’s diary, although not your father-in-law sadly. One of the 21st was Simon Rabinovitch, a much loved man who died when he fell down a mine shaft during an airraid.